There are many trimmings besides frosting that can be used for cake decorating. Some of the common items are chocolate, candy, coconut, fruit, and nuts. Used alone or combined, these trimmings will make an interesting cake decorating design on an otherwise plain cake. 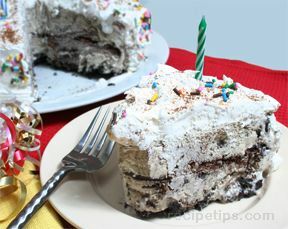 Some cake recipes may call for one or more of these trimmings because they are necessary for that type of cake, but if you have a plain cake that you want to dress up, you can use your imagination to create your own unique cake. An easy and fun cake decorating idea that the kids will love helping with is to use a Christmas tree cake pan and make your favorite cake recipe. Cover it with green frosting and then use candy to decorate it. You could use gum drops, M&M candies, Skittles, licorice, peppermint candies, candy canes . . . the choices are endless! This is just one example of many cake decorating ideas you could use. 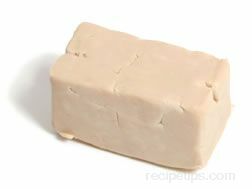 When using other trimmings for cake decorating, there are a couple of considerations listed below that you should keep in mind. 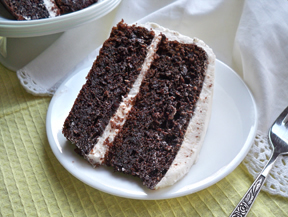 When creating your own uniquely decorated cake, be sure to select trimmings that will go well with the flavor of both the cake and frosting. 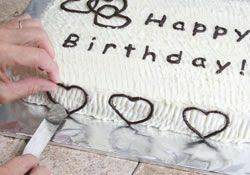 If you are decorating birthday cakes, special occasion cakes, or holiday cakes, use trimmings that are related to that occasion. 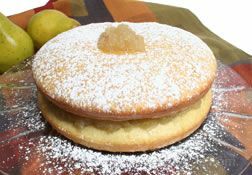 If the cake is placed on a cake plate or board, which will be used after the cake is decorated, protect it by placing wax paper all around the bottom edge of the cake. Candy can be used to decorate birthday cakes and other special cakes. 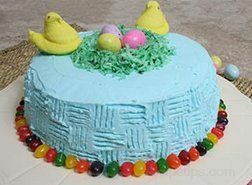 Using candy allows you to use a lot of fun cake decorating ideas for kids. Candy is generally easy to work with so it is perfect for letting the kids help decorate. They will enjoy it and be very proud of the end results. 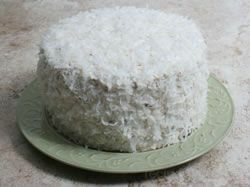 Using coconut is a great cake decorating idea. 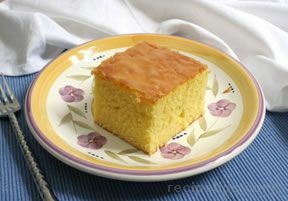 It creates an interesting look and adds delicious flavor to the cake. 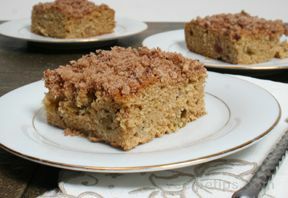 You can use regular coconut or toasted coconut. 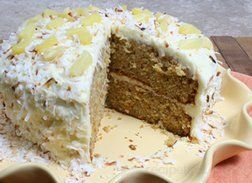 When you are going to add coconut to a cake, be sure to have the cake plate or board covered with wax paper to protect it from dropped coconut. 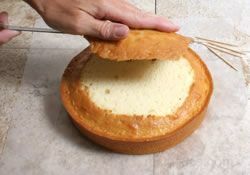 Note: If the cake is on a cardboard cake round, you can hold it over a pan to catch the excess coconut; or place the cake on a lazy susan or on a large can placed in a pan to catch the excess coconut. 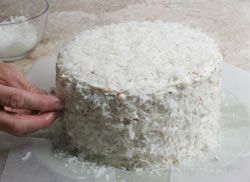 Begin sprinkling the coconut on top of the cake. 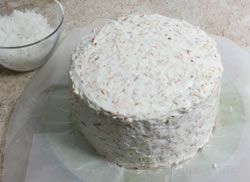 Cover evenly and then gently press the coconut down on the frosting to get it to hold. 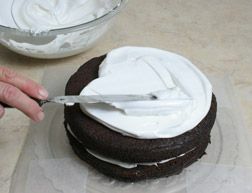 To apply to the sides, gently press the coconut into the frosting so that it will hold. Continue to apply coconut until the sides are covered evenly. 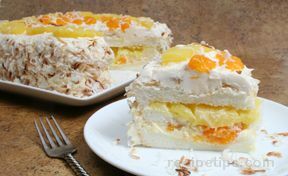 Cake decorating with coconut creates a beautiful cake with added sweetness. Using fruit to decorate a cake provides a lot of options and can add a lot of color to a plain white cake. 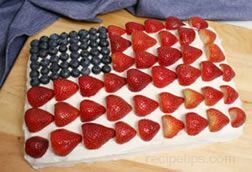 Using blueberries and strawberries to decorate a white cake like this Flag Cake Recipe is a great cake decorating idea for a 4th of July celebration. 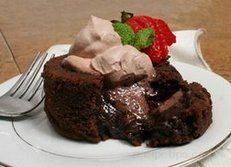 This Lava Cakes Recipe has been dressed up with the addition of a strawberry garnish. 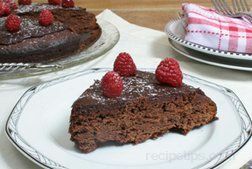 A Fudge Cake with Raspberry Frosting Recipe has been topped with raspberries for decoration. 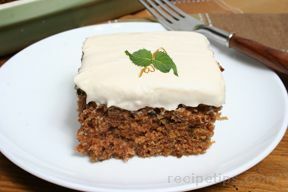 A combination of fruit and other trimmings, such as the coconut shown on the Tropical Carrot Cake Recipe above, can be added to dress up the cake according to the theme of the cake or just to decorate a plain cake as you desire. 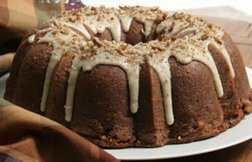 Nuts can also be added for decoration and flavor. 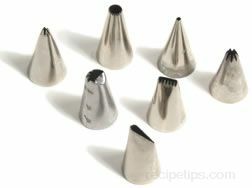 They can be used whole or chopped depending on how they are being used. A sprinkling of chopped pecans is a nice addition to a glaze on the right type of cake. 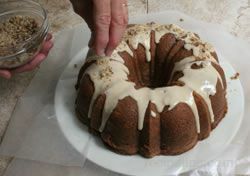 Be sure to add the nuts before the glaze begins to set so that they will stick to it. 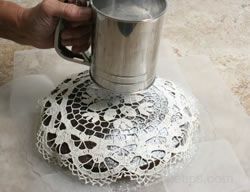 Note: If using wax paper under the cake to protect the cake plate or board while applying the decorative trimmings, it can be removed once the trimmings have been added. 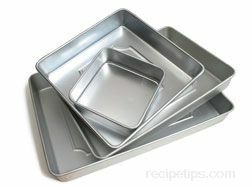 Slowly slide the wax paper out by carefully sliding it left to right as you gently pull it out. 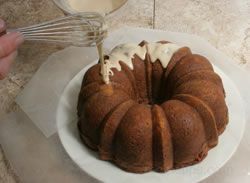 Do not just pull it out towards you because you will run more of a risk of damaging the bottom edge of the cake and frosting.